I decided to do two different types of fish as I thought the cajun flavor would be a bit much for the kids. So ... the bits of fish on the left are done with a lemon/salt rub. The bits on the right are the cajun ones. Make Salad - Half fill a saucepan with water. Bring to the boil over high heat. Add corn and beans. Cook for 3 to 4 minutes or until beans turn bright green. Drain. Refresh under cold wter. Pat dry with paper towel. ( I didn't do that - didn't seem necessary when I'm fixing to pour lemon juice on top of it !!) Combine corn, beans, onion, 2 tablespoons lemon juice and coriander in a bowl. Season with salt and pepper. Sprinkle seasoning over both sides of fish. Gently rub onto surface with fingertips. Heat a large, non-stick frying pan over medium-low heat. Spray with oil. Cook fish, in batches, ( I didn't do batches but rather used two frying pans as I was cooking two different flavors !) for 3 to 4 minutes each side or until just cooked through. 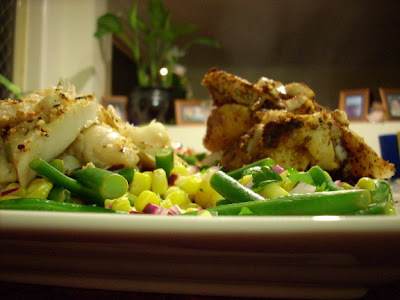 Serve on top of corn/bean salad. This was nice. Rory really liked the corn/bean salad. The cajun fish was SPICY but I'm realizing now that I used WAY MORE than 2 tsp of the seasoning ! I just poured it on !! I can't decide which photo I like best so I'm posting them both ! 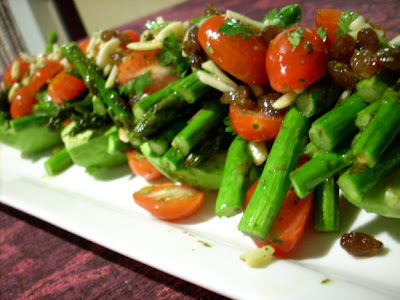 Combine asparagus, tomatoes, almonds, sultanas and basil. Mix together all dressing ingredients and pour over asparagus mixture. Toss to combine. 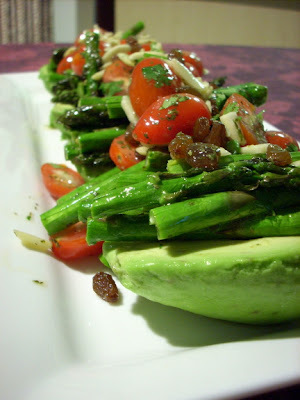 Place on top of avocado halves and garnish with coriander leaves to serve. You said you would only post the fabulous recipes, so I'm going to have to give this one a try! I am not a seafood eater though. I'd like to be...could you recommend any other fish? I don't think I've ever heard of dory. Also, for the shrimp dish your mom posted, what kind of shrimp do you buy? Punnet is a new word for me. Methinks it is used more down under than it is over here. As for the shrimp, I bought them raw and already peeled. They were not tiny little salad shrimp not were they the giganic ones. I'll have to post some more seafood recipes I see ... I'm a seafood LOVER !! Yum Yum Yum. I have to stop typing now, I'm getting hungry !! Thanks for the info Bonnie! I think I will experiment! Seafood is so popular here! Of course salmon...and halibut. I've eaten halibut and was not too disappointed. Did not care too much for the salmon. I think it was the way I prepared it though. I'll have to try Rory's salmon marinade next time! I'm about to set a record for how many comments I can leave on one post, but I came back for the recipe and had to tell you that you are so fortunate to have such fresh avocados where you live! I have had such bad luck getting a good one up here in Alaska! :o( It's a shame too because I LOVE avocados so much!